ibis Styles Haarlem City is located on the sports boulevard in Haarlem City. Plan your trip to Amsterdam or the Dutch Seaside easily as Bloemendaal is only 2km and Amsterdam is 20km. Haarlem is one of the famous monumental cities in the Netherlands. It has a historical City Centre with 1,149 national monuments such as the Grote of Sint-Bavokerk at the Grote Markt. Haarlem has 22 museums and exhibition spaces such as Teylers Museum, which exhibit sketches of the Italian artist Michelangelo. 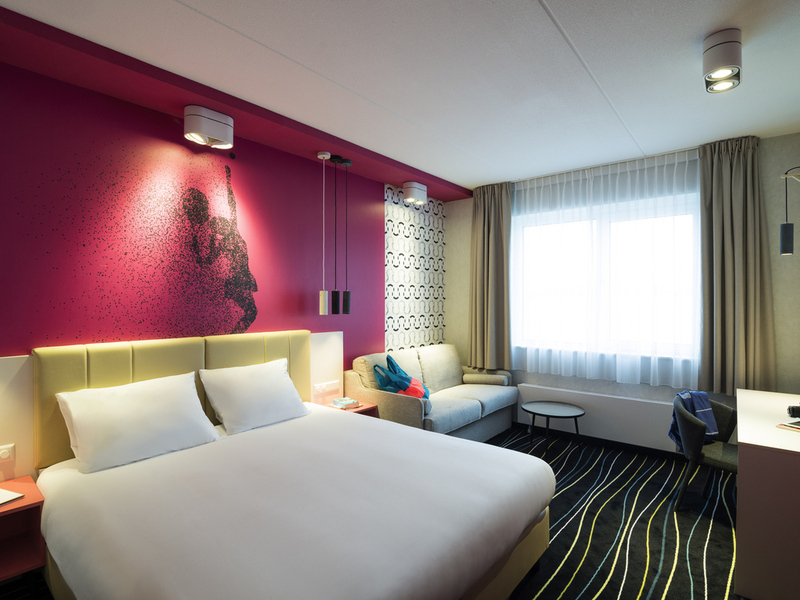 The brand new ibis Styles Haarlem City is situated on the sports boulevard of Haarlem. From here it's easy to reach either Amsterdam or the coast. The vibrant and cosy city centre of Haarlem is within a 1,9 km reach from the hotel. Payments can only be done by credit or debit card (debit card only at check-in). We do not allow cash payments. Pets are not allowed. Warm, welcoming and modern, with a comfortable bed and a practical bathroom, our rooms offer everything you need for an enjoyable stay. Whether you choose the Cosy room, Motion room or Family room: your comfort is guaranteed. You will definitely be surprised by the energetic design of the hotel. Our room was spacious and spotlessly clean with all the basic necessities for our three night stay. The staff were friendly and very helpful. The breakfast was perfectly adequate and a very welcome touch was the complimentary tea and coffee - this made up for the lack of drink making equipment in the bedroom. The hotel and room were very clean and comfortable, however the room was too warm. I turned the heating off but it turned on again and I tried to lower the temperature but the minimum was 21C and returned to 22C anyway when it turned on again. The bar did not take cash which I didn't see in the description. Also I received my voucher for a free drink I was surprised I couldn't get the local beer but only Heineken which I don't like, I understand this is not a right but would have been a nice touch. Beautiful, clean hotel with amazing, helpful, friendly staff. The stay was okay but it was the only Accor location were I as a member to the Club didn't got a Voucher for a welcome drink. Booked the hotel for my parents, they are not used to staying in hotels and are getting a bit older. The hotel helped them very good with supplying a room on the ground floor, so my parents didn't have to walk far. My parents were very content with the experience, everything looked new, and clean. They liked the choice at the breakfast, but remarked that there should be more fresh products. Special thanks to the reception for helping me out with making an unusual booking. Excellent - good location, very clean and modern with very friendly, helpful staff. Ibis style hotel in Haarlem city, fantastic stay with my wife, very clean, friendly staff, good breakfast. The hotel ia very popular lots of guests but noise free. 24 houre free coffee and tea, not many places would do that. Except the check-in everything went ok. Check-in: forgot passport at work, and reception staff didn't authorize to check-in without ID. I slept over 40 nights in the Ibis for the last 4 months. It's sad. First time in a Ibis style hotel, rooms clean, good breakfast, very very helpful staff. I and my wife highly recommend Ibis Style hotel in Haarlem city. The stay itself was satisfactory, however clear communication regarding extras fees to pay was not, in fact completely missed. I had a total fee of €13 to pay at the hotel (City Tax) that had been emailed to me, I then turn up at the hote and get charged €20 with no explanation. I challenge this the next day, and get told the price has gone up. There had been no communication about this, no apology. My booking email stated €13, I expect to pay €13. A modern clean hotel! Very friendly staff! Rooms well laid out bathroom particularly nice and spacious. Train is 5 mins away with quick access to Harleem city centre and Amsterdam! Great stay would come again! We were in this hotel one night and had a really nice stay. The rooms were tidy and the breakfast was tasty. The interior was trendy and the staff was kind. The city center of Haarlem was only 2,5 km away. Nice and clean, new hotel. The hotel was ok, nothing more, nothing less. Not sure if I will stay on my next visit to Haarlem. Positives: clean room, polite and helpful staff. Negatives: The climate control was frustrating in that it didn't ever reach temperature - it was warmer in the corridors than in the room. Also, I absolutely hate not having a kettle in the room. I know you have a vending machine downstairs, but the minimum I expect from any hotel is the facility to make a cup of tea in my room - especially when the room is so cold. We had a great stay in this nice and new property. Very friendly persons a the reception - nice breakfast. The room was perfect. Only negative point: we had room 005, you can hear the cars on the road even in the evening/night. Breakfast simple if you compare this with the price.